Louis Armstrong, “The Complete Hot Five and Hot Seven Recordings” (Sony, 2006; tracks recorded 1925-29). To celebrate the centennial of Louis Armstrong's birth, the folks at Sony/Legacy have created a terrific tribute to the man with this lavishly produced box set. 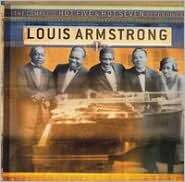 Consisting of Armstrong's groundbreaking Hot Five and Hot Seven recordings he made for the Okeh and Brunswick labels, from 1925 to 1929, nearly every note he recorded in that period is here, including extremely rare alternate takes of "Drop That Sack" and "Wild Man Blues". The engineers who did the mastering for this should definitely deserve serious praise for the remarkable job they did getting the best sound possible out of these vintage recordings. The packaging is just as stunning as the performances contained inside. The set consists of a hard cover book(housed in a slip case) with excellent liner notes and lots of rare photos. The Complete Hot Five and Hot Sevens Recordings was produced by jazz historian Phil Schaap who I think should start writing his grammy acceptance speech now, because this package is everything a great box set should be. Truly an excellent and loving tribute, and comes highly recommended. 21. Was It a Dream? 16. Hear Me Talkin' to Ya?